Calling all lifted 4-door magnetic grey trucks!! 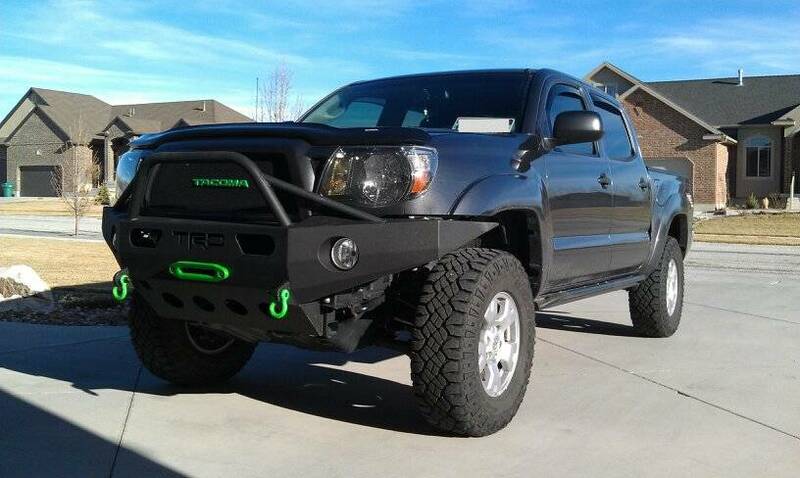 Discussion in '2nd Gen. Tacomas (2005-2015)' started by Glockman18, Sep 22, 2010. I've got the mod itch and want to see what my truck would look like with some stuff done to it. 4 door, long bed if any. Magnetic grey. Thanks! It may take some time, but here's the link to the Mag Grey thread for you to browse through. ^^^^ that gif is epic! Thanks. I had barely stopped laughing/crying when I added it to my sig. Also, to the OP, just want to warn you...you may think you have the mod itch now but wait until your done with that thread! Your gonna scratch til your wallet bleeds! Good luck buddy! Got any specs on lift/wheels/tires? Toytec Ultimate with AAL and stock rear shocks(for now). Just installed. Still need tires. Going to try Duratracks. Great ride. Just a little firmer than stock. Installed 3" from Toytec about 4 weeks ago. 5100 Bilsteins w/ coilover on front and Bilsteins plus 2" AAL on rear. It's not that hard as long as you take your time. I think you should go a anthracite/graphite HLM. They also make the smoke paint that will look just like the factory 09-11 headlights....Sweet! haha i lack patience when it comes to working with things like that. once i get my hands on a spare set of head lights...i'll give it a try. Dang, that looks just like how I want mine to look..I have the Bilsteins at .8 in front, just saving up for Eibachs, AAL, and LR UCAs.....do you have new UCAs with yours? I'm currently at 36" in front, 37" in back even with the front ones on the first clip. I LOVE the DURATRACS, even got a buddy of mine w/ a Z71 to join the DURATRAC Club!!!! Speaking of duratracs, here they be on my truck. Link to my build page in the sig. Might be worth a look to give you some ideas... Mine is a short bed though. Here's mine. 5100's up front. 275/65/18 Terra Grapplers.